I didn't have any compressed yeast, so I just used a packet of dry yeast. That worked fine. 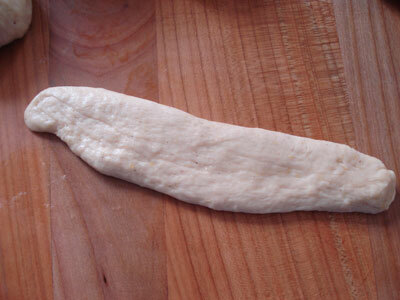 Making the starter sponge (the fermented yeast starter) eliminates any yeasty flavor. 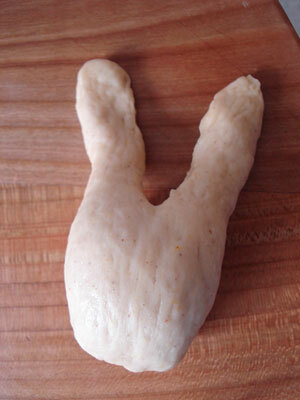 For the flour I used Zopfmehl (farine per tresse) which is a high gluten flour; in the U.S. use bread flour. I added the grated zest of an orange as well as the zest of a lemon. Instead of the mixed spice, I used a Lebkuchen spice mix, which has cinnamon, ginger, cloves, nutmeg and star anise in it. You can use a combination of your favorite baking spices here, but cinnamon should be one of them. I think cinnamon, ginger and nutmeg should make a nice mix. For the dried fruit, I just used some dried cranberries, which I'm rather into at the moment. They'd be just as good with raisins or currants. So, once you've done the two dough risings, divide it into 12 pieces and round off the 12 pieces. Rest them on your working surface with a clean kitchen towel over them, for at least 10 minutes. 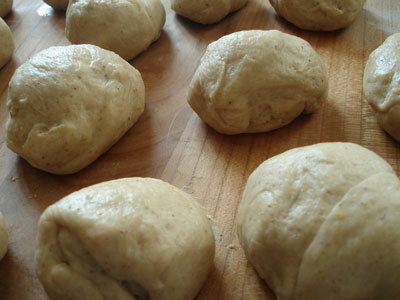 This allows the dough to rest and recover, ready for the next step. 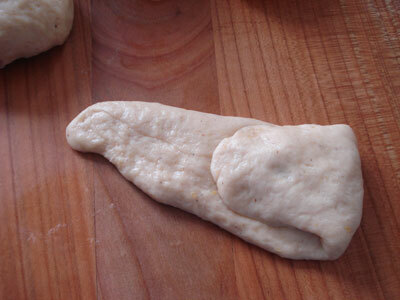 Take a piece, and roll it out into a little sausage, then flatten out the sausage. You could use a rolling pin, but I just use my hands. This dough is nice and buttery so you shouldn't need any flour to stop the dough sticking. Put a few dried cranberries or raisins etc. on 2/3rds of the dough, and press into the dough. 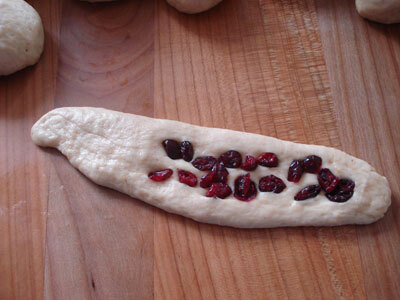 Fold the dough over to cover the fruit. 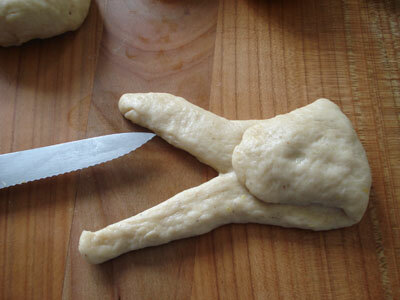 Cut the remaining dough in half, lengthwise, with a sharp knife. These will be the ears. 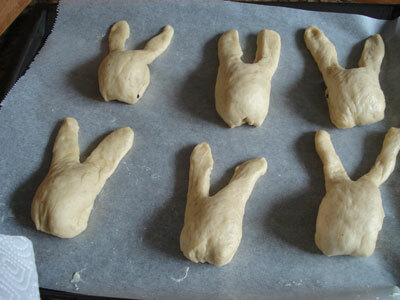 Fold the ears up and over the rest of the dough. 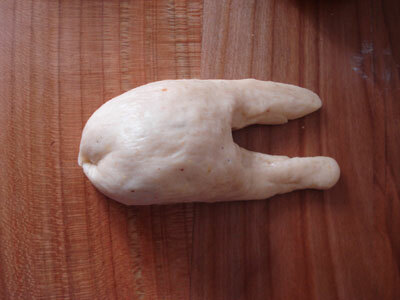 Squeeze the dough (the face) so that it's quite narrow. Here's another view of a single bunny. Arrange them on a baking sheet that's been greased or covered with kitchen parchment paper or a silicon baking sheet, far apart so they won't touch after another rising. Cover with clean kitchen towels or plastic film and leave to rise for about 40 minutes. Don't forget to turn your oven on to heat up (to 240°C / 475°F) 15-20 minutes before the rising time is up. 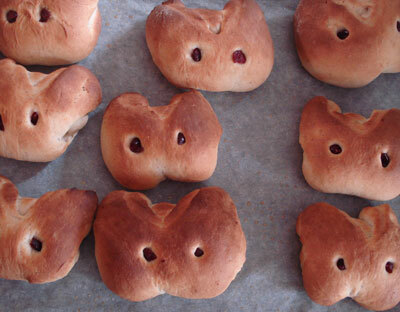 Here's a tray of bunnies with eyes. I have 6 bunny buns per sheet - 2 sheets total. Put both into the oven and set a timer for 5 minutes, then rotate the sheets (so the one on top goes below, and vice versa) and bake for another 10 minutes or so until the buns are a fairly dark golden brown. 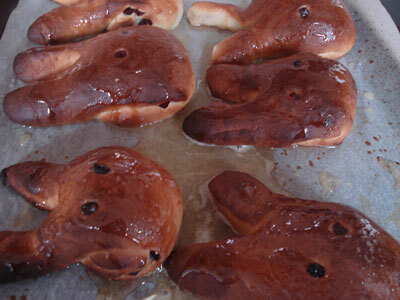 Glaze the bunny buns with golden syrup or honey that's been warmed through until very runny, while still hot. I used honey. Serve warm. 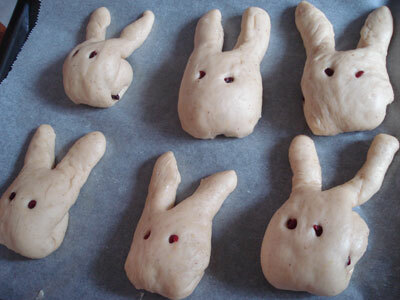 If you want to make these for Easter Sunday, they are best if you can bake them in the morning. In order to accomplish this without waking up at a ridiculously early hour, you can make the dough the night before, do the first 1 hour rising, and then leave it in the refrigerator in a tightly closed plastic bag. 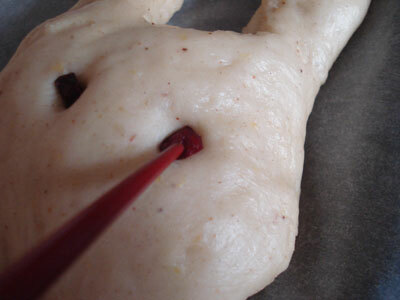 Take it out in the morning and form the cool dough, and do the final 40 minute rising. Alternatively, you can bake them before and freeze them without the glaze. Warm them through in the oven (at around 160°C/325°F) wrapped in foil for about 15-20 minutes until warmed through, and then glaze. It's quite important to make the bunny faces quite narrow as shown. 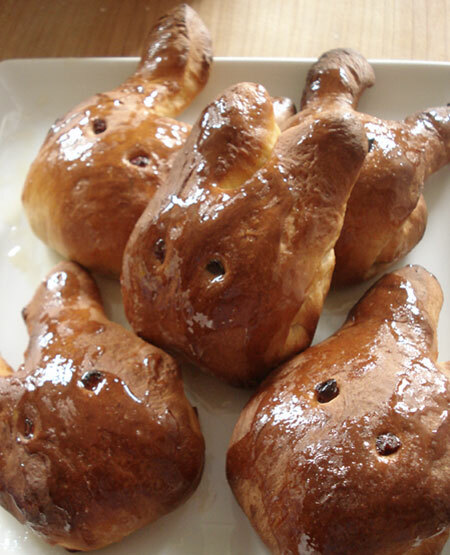 If you make fat faced bunnies, after rising and baking they turn into odd, unbunny-like things, sort of like mutant cousins of Hello Kitty. Here's a batch that didn't work out that well. 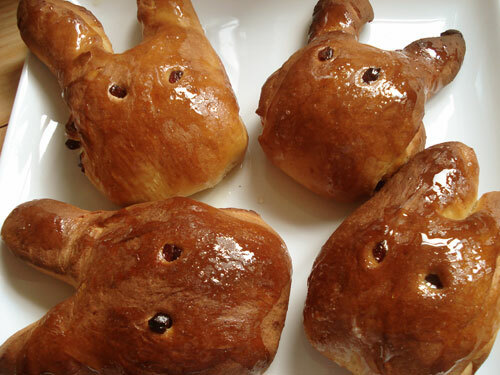 You might wonder, what happened to the Cross part of the Hot Cross Bunny Buns. 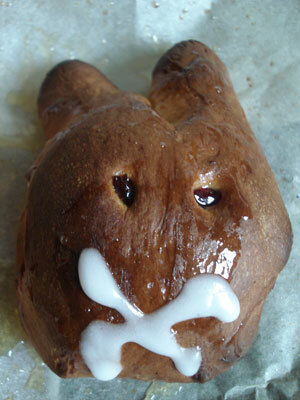 Well, my initial idea was to apply an icing cross as the mouth of the bunny. But that turned the cute bunny face into something rather reminiscent of Silence Of the Lambs. So I left out the cross. I guess you could apply a small cut-in cross with a knife, if you need to keep that religious symbolism in there. Turn them into the best bread pudding ever. Submitted by hungryelf on 2008-03-18 19:10. Your bunnies are also reminisent of Peace Signs. Bunnies, peace, Easter. It all works. Bet it tastes good, too. The good ones, that is - the bunnies gone bad made me laugh though! We're away over Easter, so I won't be baking this year, but home-made hot cross buns are definitely better than any I've bought in the shops. Awesome recipe, and the bunny looks cute too. Easter's is in the weekend time for me, and I do look for ward to much Hot Cross Buns, but maki's bunnies looks better and would definitely taste good. Happy Easter everyone! The second picture looks like nicely roasted spring chicken! I bet the bunny ears are the best part. Have a good easter! Those look yummy! They are too cute to eat. I'm sorry, but I am a professional pastry chef, having graduated from Peter Kump's Culinary Institute in Brooklyn, New York. As a PROFESSIONAL (although temporarily unemployed) I would NEVER waste my time on something like this. But, it's your blog. And on MY internationally-famous blog, I post PROFESSIONAL recipes and photos of me with my many tattoos and body piercings. You can also see photos of my bofriend "Big Bear" (he looks just like Bobby Hill on "king of the Hill" program. Please excuse his drooling on his tee-shirt when I hugged him. I can honestly say, that is the oddest comment I've ever gotten here. You win. But yours are by far the most adorable!!! Love them! That was a rather odd comment was it not? Anyways, I am a professional and employed chef and I adore your work and your blogs. I am glad you are feeling a bit better. This dish looks cute and yummy. 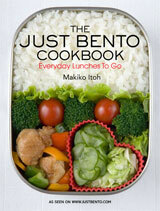 What is food if we can not find the pleasures in the creation and consumption of it all? It is bunny love for us this Easter, too. Thanks again! I'm going to have to try this. I don't celebrate Easter (I celebrate half priced chocolate bunny day :)) but these are too cute to pass up!